Life as an academic is hard, if you discount the summers off and the whole tenure thing. Assuming you’ve ever submitted a piece of research for publication, chances are you’ve had to go through the process of peer review—an often soul-crushing ordeal during which you and your ideas are metaphorically flayed by a jury of your peers. The idea sprang up after one of the university’s directors solicited suggestions for what to do with the school’s giant concrete block, which was apparently left over from World War II. 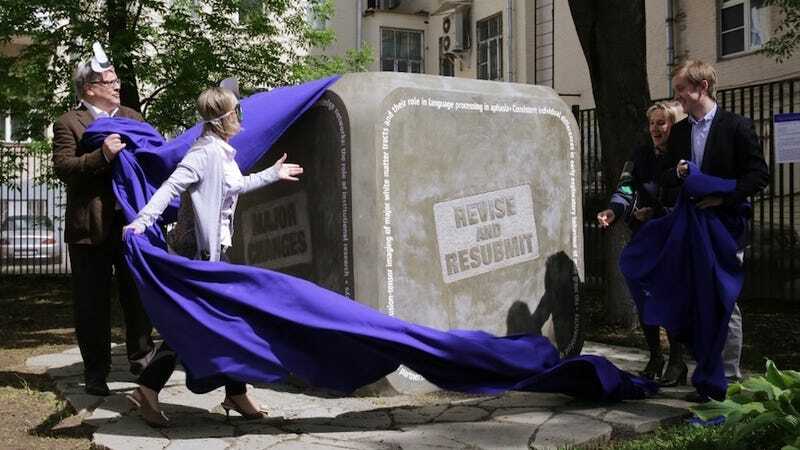 HSE sociologist Igor Chirikov proposed a monument to peer review, and a Kickstarter was launched to raise money for the quirky idea. Bloggers may not have much in common with research academics, but I’m sure we can both identify with the concept of “nasty comments from reviewers.” Let’s just hope the block doesn’t become the new crying spot for rejected academics.